For Pamela Skaist-Levy and Gela Nash-Taylor, far-flung inspiration has always been part of their M.O. 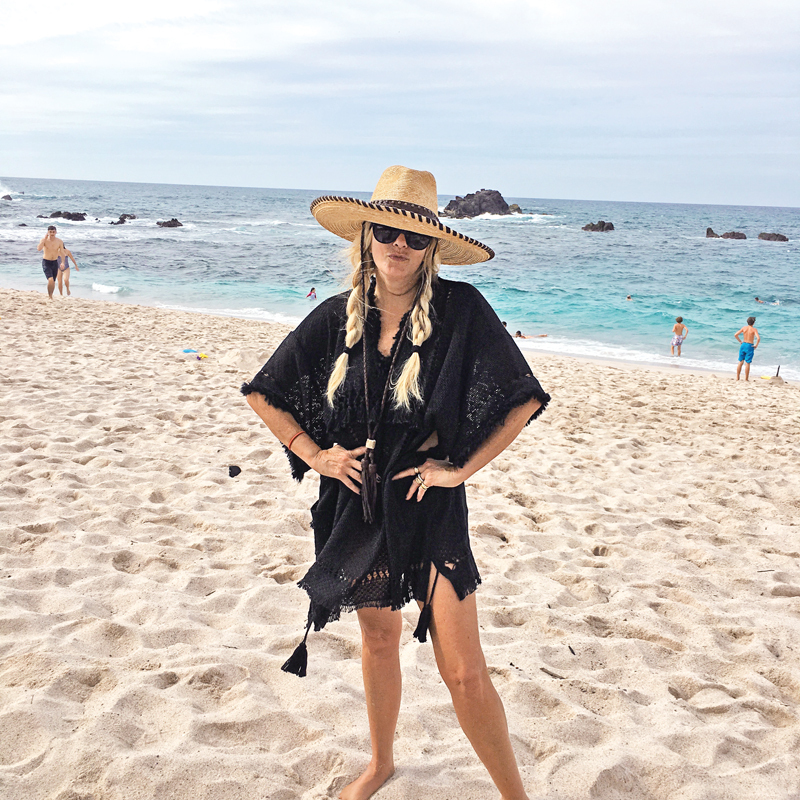 As hippie chic co-founders of Juicy Couture and current masterminds behind up-and-coming brand Pam & Gela, the best friends and long-term collaborators find their private bliss in Mexico and Morocco. Pam on the beach in Punta Mita. What intrigued you about this place? I love exploring Mexico. It’s my drop-out spot of choice. For my big 5-0, I rented the Moor-inspired palace Cuixmala, which was once the private home of James Goldsmith. It’s bohemian glamour to the max, set in a private tropical hideaway with sweeping swimming pools overlooking miles of untouched white sand beaches and a wild game reserve with zebras and giraffes roaming the grounds. 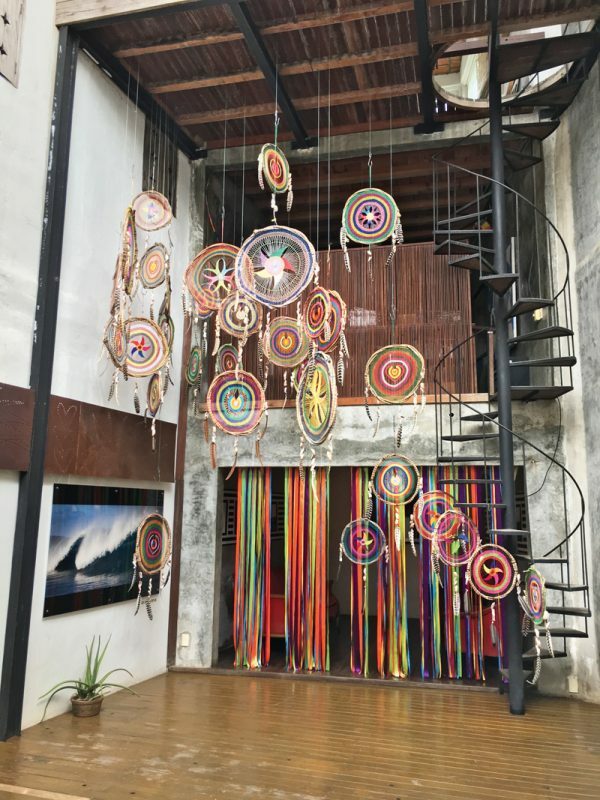 La Lomas, the main house, was one of the most beautiful and legendary homes I have ever seen. The look, the weather…it was amazing. We went to houses all around the neighborhood and looked at the architecture. And we drank a ton of tequila. 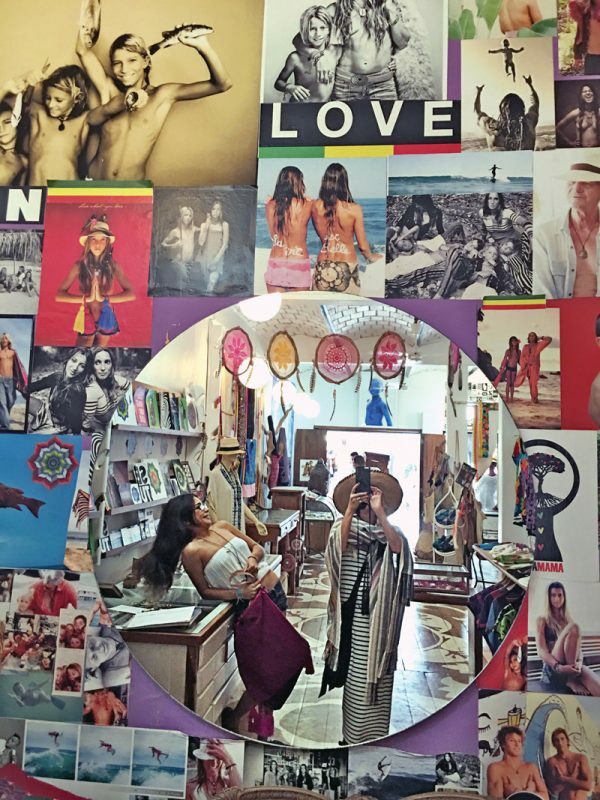 We took a day trip to Sayulita, which is a hippie surf spot about two hours away. How long have you been going to Mexico? I’ve been going there since the ’70s with my parents. We used to go to Mexico City and Acapulco when it was amazing, and now, it’s having a resurgence. 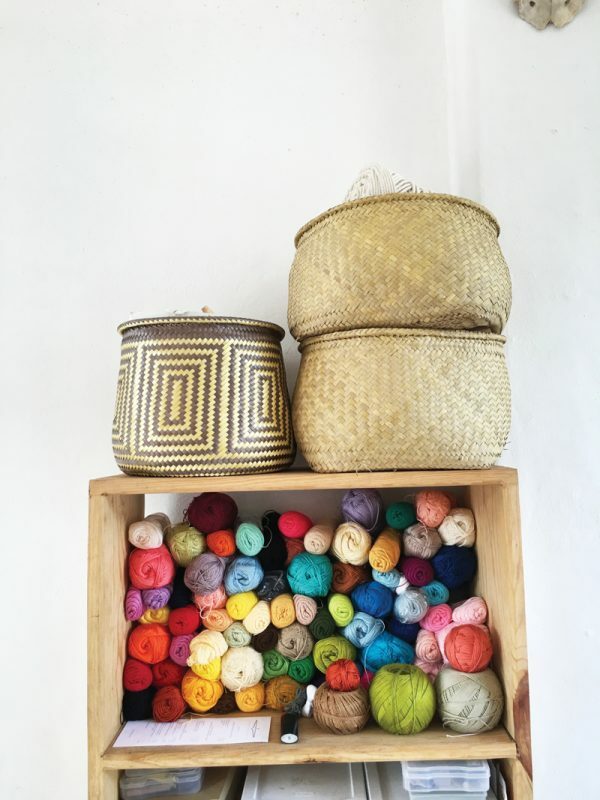 A Sayulita boutique specializing in hand-dyed yarn and baskets. An exterior of the boutique Pachamama, owned by the famous Mignot sisters. 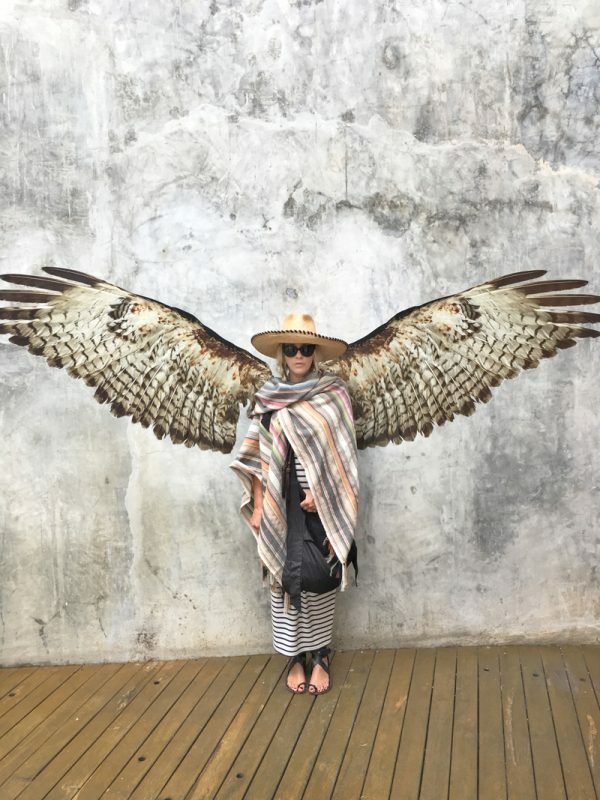 Standing in the wings at La Casa Love Hotel in Sayulita. A closer look at Pachamama. The beach at Punta Mita. Really amazing! It wasn’t polluted, the water was incredible…it was totally different in the ’70s. I grew up in L.A., in the San Fernando Valley. My dad’s a doctor, and my mom was the Martha Stewart of the Valley. My parents are New Englanders, and they came to California, saw the sunshine, and never went back. 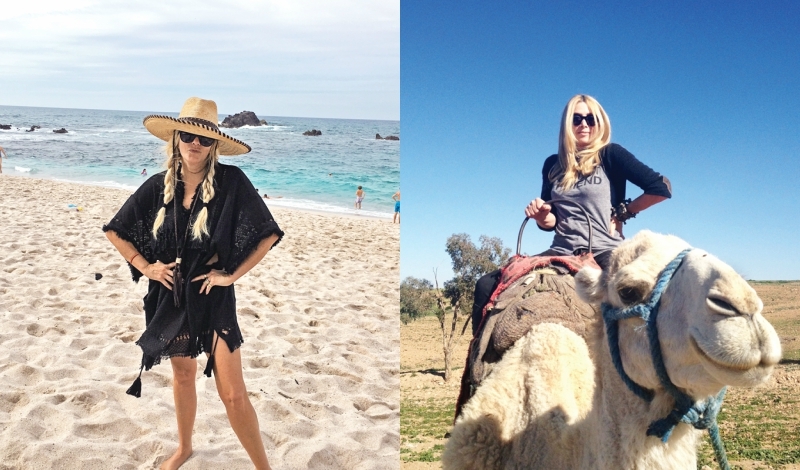 We grew up, all of us, totally obsessed with beach vacations all around the world. We love the water—my mom boogie boarded into her seventies! We’re tanorexics who love the sun. Yes. Well, I was. My brother is still a big surfer! How often do you go to Mexico now? Any chance I can get. It’s two hours away, so it’s an easy weekend spot. 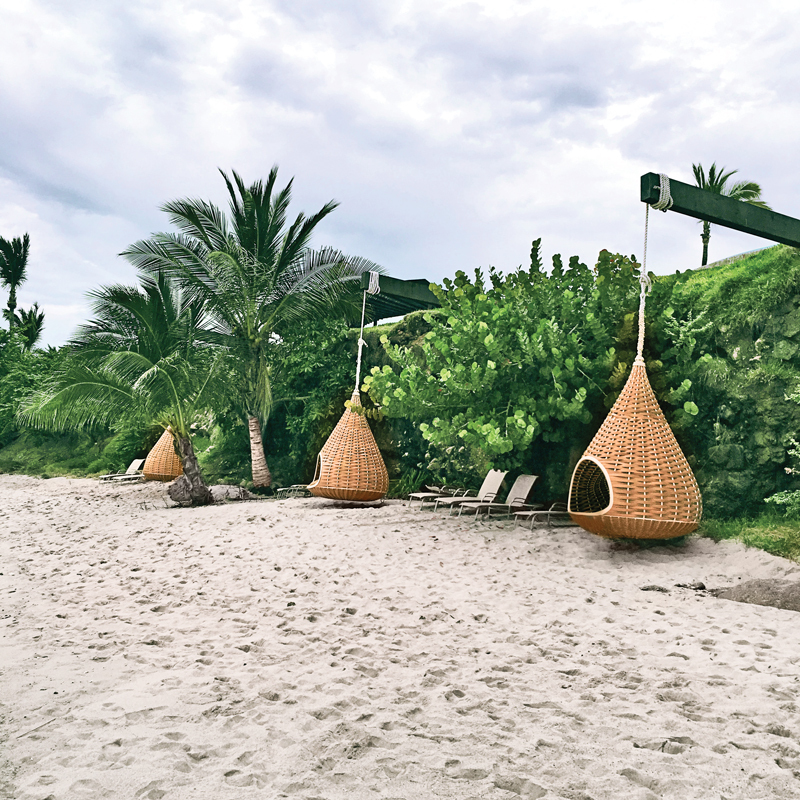 We love the Four Seasons Resort Punta Mita. The food and service are incredible; I love the Mexican people. I really just like being in the water, and if you’re adventurous, get in the car and go to Sayulita! Are you a big eater when you’re on vacation? I love Mexican food. It’s really, really clean. And the fish is so fresh! A big hat, a bathing suit, and a serape or hippie dress. I can’t tell you how much we love a beach vacation. But my son is so normcore, he’s not into the beach thing. Sad, but true. That’s why we went to Japan over Christmas! Gela catches a ride in the Atlas Mountains. How did you end up in Morocco? My husband [Duran Duran’s John Taylor] and I have a house in England. 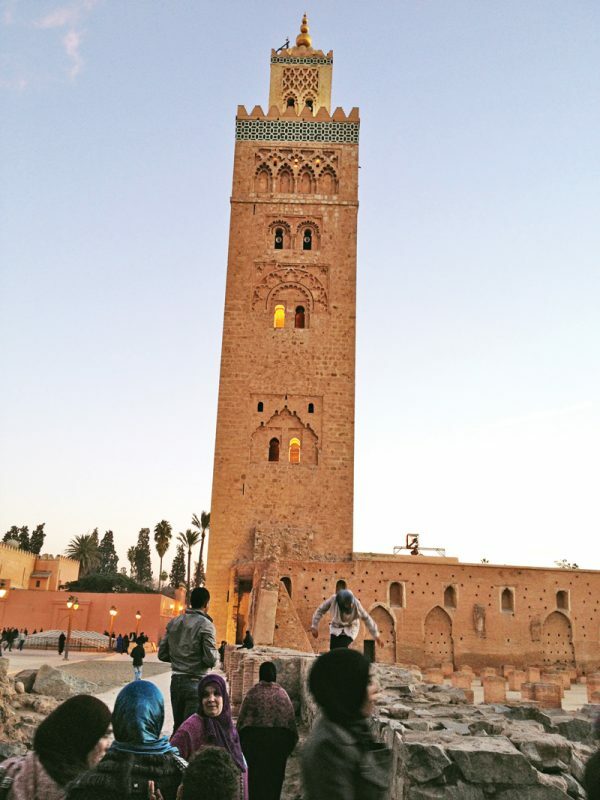 Morocco is pretty close, and I had always, always wanted to go to Marrakech and Tangiers. For years and years, we went to all the major cities, like London and Paris and Sicily and Rome, but I wanted to go somewhere more exotic. We finally went, and it was unbelievable—we had the most amazing time. You and Pam are so visual—Marrakech must have been a feast of the senses. From the second you land at that beautiful airport, you look at the city, and it’s all that same amazing color of reddish-orange. It looks like a jewel in the desert. How did you spend your first night there? We went out! I wore my little Dries fur, and we went crazy. The belly dancers! 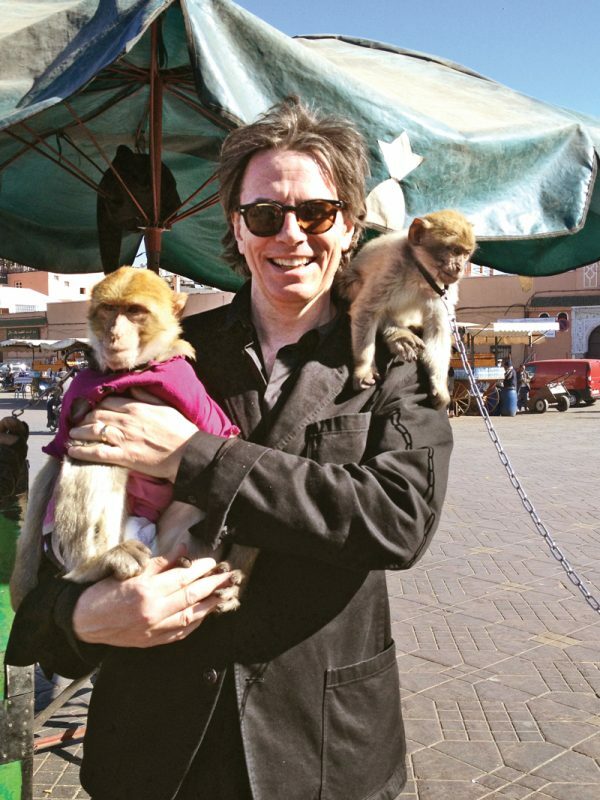 John looks very comfortable around the monkeys. One of them could have been wearing a Juicy tracksuit; it had that kind of vibe. I woke up in the middle of the night and said to John, “What happened to us?” It was like I had a bull’s-eye on me—everyone who was trying to sell something was like, “Yep, that’s her!” They’d pull me into the souks. The jewelry! I was out of control. I went absolutely crazy. Taking a shopping break in front of Royal Mansour. 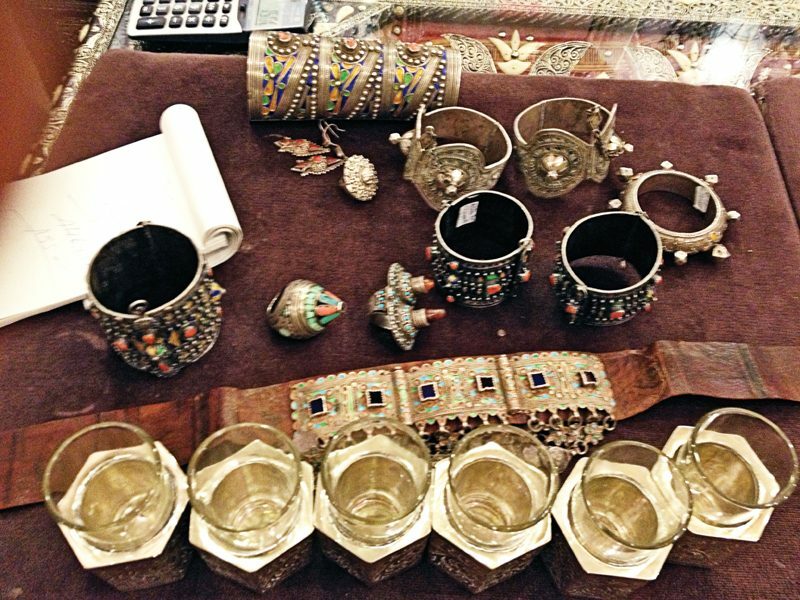 Jewelry shopping in the souks in the medina in the Old City. 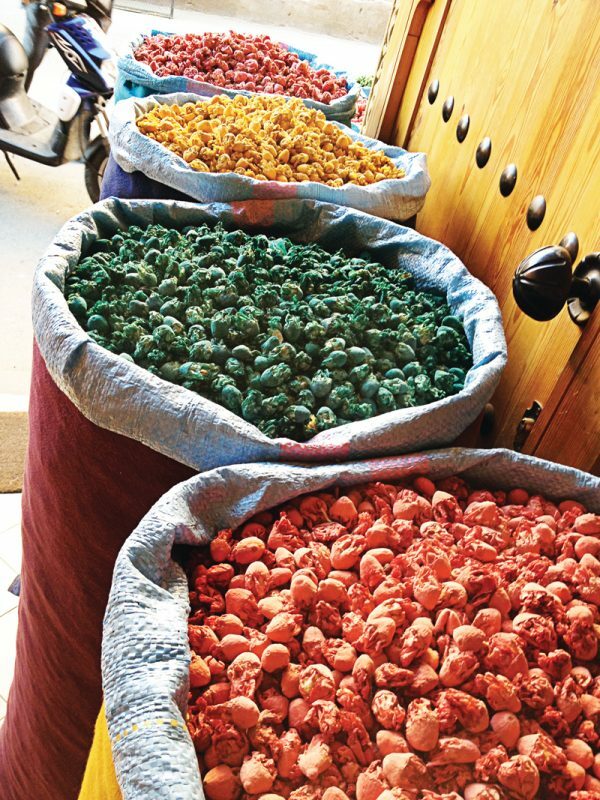 Taking a closer look at the spice scene in Jemaa el-Fnaa square. Gela’s husband, musician John Taylor, makes some special friends in Jemaa el-Fnaa square. What did you think of the Majorelle Gardens? They made me cry. They were so beautiful! I really got the sense of Yves Saint Laurent and all those dropouts, going to Morocco, smoking hookahs, and being liberated while surrounding themselves with the most beautiful visual things. I have a friend who has a house in Tangiers, and John ran into someone who just got back from the Sahara, and they went on a tent trip that they said was life-changing. But I loved every second of Morocco. Pam: Gela brought me back the best birthday present ever, ever, ever. She had a Moroccan tent sent home and set up for my surprise party. The pictures of that party are amazing! You look pretty fearless on that donkey. I loved it. That donkey was brilliant, and I could have gone across the Sahara on him. I was a big rider as a kid—I had a horse and a pony. 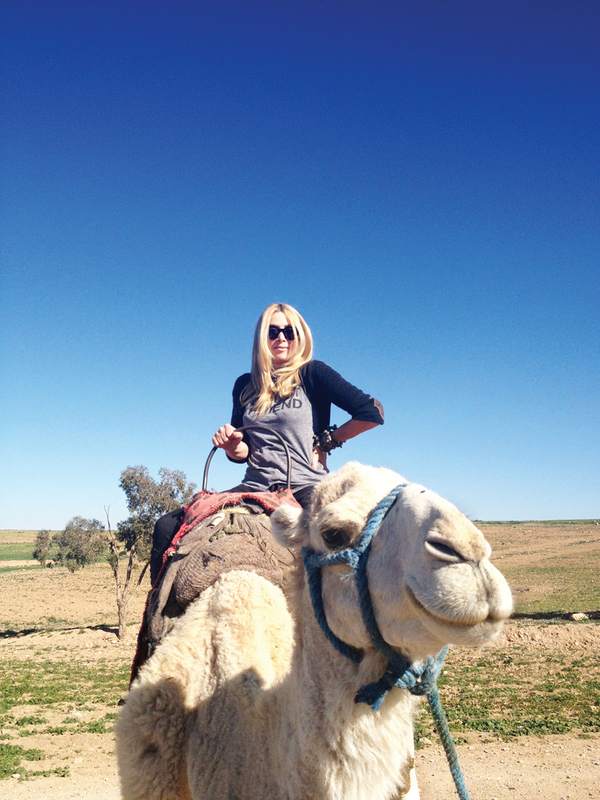 But it was very hard to get John up on that camel, I have to say. Amazing photos! Looks like such fun trips!